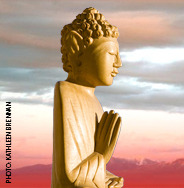 Taos Mountain Sangha promotes the teachings of the Buddha and the practice of insight meditation. Insight meditation is also known as vipassana and means insight or clear seeing into the nature of reality. Considered as one of India’s most ancient techniques of meditation, it is attributed to Gautama Buddha. It is a way of self-transformation through meditation and mindfulness. Taos Mountain Sangha hosts a full program of weekly meditation sittings and Dhamma talks, ongoing classes, including beginner – intermediate classes in meditation, and nonresidential retreats at various times throughout the year. The Sangha invites guest teachers, including many well-known teachers such as Stephen Bachelor, Eric Kolvig, Dae Ja Napier, Wes Nisker, Marcia Rose, and others to participate in the Sangha’s programs. Taos Mountain Sangha was established in 1996 by Marcia Rose, a guiding teacher of vipassana meditation, together with a group of dedicated people. Today, Taos Mountain Sangha is a lay sangha, with guest teachers and members who lead meditation sits and offer Dhamma talks. The Sangha shares programs and special events with other sanghas in the region and is open to all people who wish to share in the teachings of the Buddha. Taos Mountain Sangha Meditation Center has moved. As of January 1, 2014, we will be located at 522 Paseo del Pueblo Norte, at the corner of Theodora Street. Look for the roadside sign: Taos Center for Mindfulness & Meditation.